Watercolor from live specimen found in western foothills of Four Peaks, Maricopa Co., AZ, 11 May 1992. The Snout Butterfly is at upper right. The Hackberry Butterfly is at lower right ... just to the left of the butterfly is a caterpillar, the immature stage of the Hackberry Butterfly. At the lower left, suspended from the stem is a Hackberry Butterfly chrysalis. An abundance of desert hackberries at Reach 11 in Phoenix, Arizona. 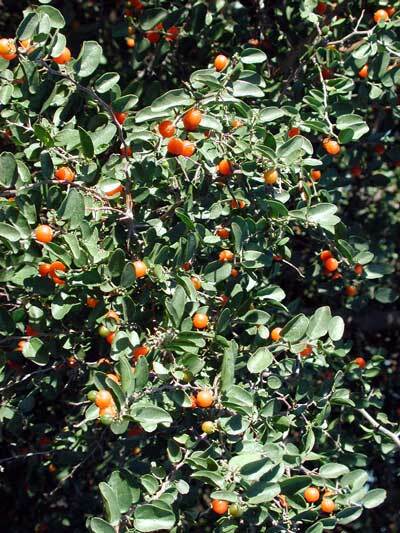 SHRUB: Large or medium size leafy shrub with dark gray or brown bark. ARMED: Sharp thorns 1-2 cm long, often with short apical spurs. The spines occur two to a node. LEAVES: Simple and relatively large. Dull green, thin, leathery, margins smooth or with a few course teeth. FRUIT: A sweet, bright orange berry, 7 mm dia., with one hard seed. Berries ripen July-Dec. with quantity and timing highly dependent on rainfall. FLOWERS: Inconspicuous yellow-green. April-Oct., again depending on rainfall. In the image above notice that the flower lacks petals and sepals. At the ovary tip are paired stigmas. RANGE: Common along washes especially with increasing elevation and available moisture. Absent from the lowest, driest areas of the Sonoran Desert. The edible berries are sweet to man and birds. Hermit Thrush, Northern Cardinal, towhees, Phainopepla, Townsend's Solitaire, Cedar Waxwing, thrashers, White-crowned Sparrow and House Finch are among the birds likely to be seen at Desert Hackberry when in fruit. Two fascinating butterflies use this plant as a larval host. 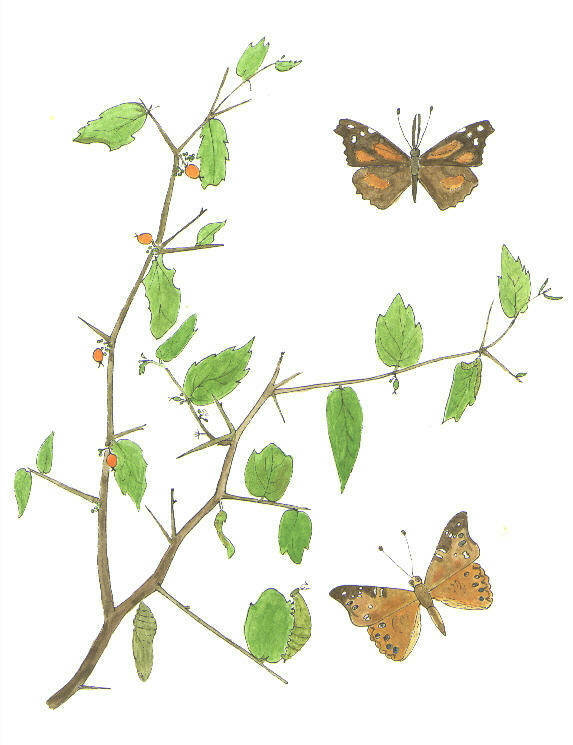 The Leilia Hackberry Butterfly (Asterocampa leilia), burnt orange with black marginal spots, will almost always be found patrolling nearby up and down a wash just a few feet above the ground stopping frequently to perch on the ground. Hackberry butterflies will chase other butterflies that happen by, doing battle or attempting copulation, often returning to the same perch. When landed with the wings folded over their back, a row of six blue-centered eye spots can be seen along the wing margin. Taking a playful attitude towards hikers they will sometimes land on a hat or lunch pail. If there is some fruit, like pear, they might come and sip a little juice but they rarely visit flowers. The bright green caterpillars are shaped like leaves and have a pair of horns on the head that look remarkably like the plant's own thorns. Sharp-eyed birds push them to look more and more like inedible thorns, a process of coevolution. Another butterfly that feeds on hackberry as a caterpillar is the Snout Butterfly (Libytheana bachmanii), also colored burnt orange. The adult butterflies have a long snout formed from elongated palps (mouthparts), and unlike the hackberry butterflies, are avid nectar feeders especially at Seep Baccharis. In early May, adult butterflies will be found ovipositing (laying eggs) on the new hackberry foliage. In favorable years these butterflies build up tremendous populations that then migrate hundreds of miles. Many of the butterflies that suddenly appear in Arizona during September come up from Sonora, Mexico where Desert Hackberry (Granjeno) is abundant. Often these migrations consist of millions of butterflies seemingly moving only north in late summer or fall. These mass movements have not been well studied; the enigma is why return migrations are not recorded. Many of the leaves on fresh spring growth will be blistered, curled, and oozing sticky honeydew as a result of feeding by nymphs of a psyllid bug. The winged adults, which emerge in May, have the curious habit of wavering from side to side in synchrony when disturbed, and can also jump. Occasionally a giant scale insect covered in white wax will be seen.